A project describes the task design for a performer. For each type of task (such as text recognition or image sorting), you need to create a project. You can view the list of created projects on the Projects page. Open the project page to view the list of pools, the project rating and the project statistics. Create and tune your project in the sandbox, then move it to the production version of Toloka. Click the Create project button on the Projects page. Choose a template. The template contains pre-configured input and output data fields and the task interface, which you can edit. If there is no suitable template, choose an empty template. Enter Project name and Description. Performers will see them in the task list. Write instructions for the task for performers. Add fields for input and output data in the Specifications block. The performer is issued a random task from the pool. The performer chooses a task on the map. Fill in the Title and Description. Performers will see them when viewing points on the map before they choose a task. To see how the task will look, click Preview. After creating the project, add a task pool to it. You can also set up quality control in the project. To edit project parameters, click the button in the list of projects or Project actions → Edit on the project page. Attention. If you edit a required field, the changes apply only to new pools. Existing pools will work according to the previous version of the project. All changes to the project are saved in the version history. 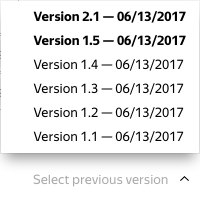 You can view previous versions or return to any of them. Add, remove or rename a required field. Change the field from optional to required. Reduce the maximum or increase the minimum number of items in the array. Reduce the maximum or increase the minimum length of a string. Reduce the maximum or increase the minimum value for a number. The minor version (the second number) appears when you make any other changes to the project. Attention. Changes to the major version of the project don't affect existing pools. Go to the project editing. Click Select previous version at the bottom of the page. Choose a version. The project parameters return to the chosen version. Save the project to use the chosen project version as current.